One thing I have really begun to get back into full-force is TTM autographs. I used to send a few out, but recently, I have found it to be a great way to get autographs of some of your favorite players, at the cost of a sheet of paper, two envelopes, two stamps, and a little bit of time. One website that has been instrumental in my TTMing over the past month is www.sportscollectors.net. It's basically an autograph-seeker's database, and what is really useful to me, is where they list each player, and their success rate, as well, as where those successful submissions were sent to, which show you where the best place to mail your items is. 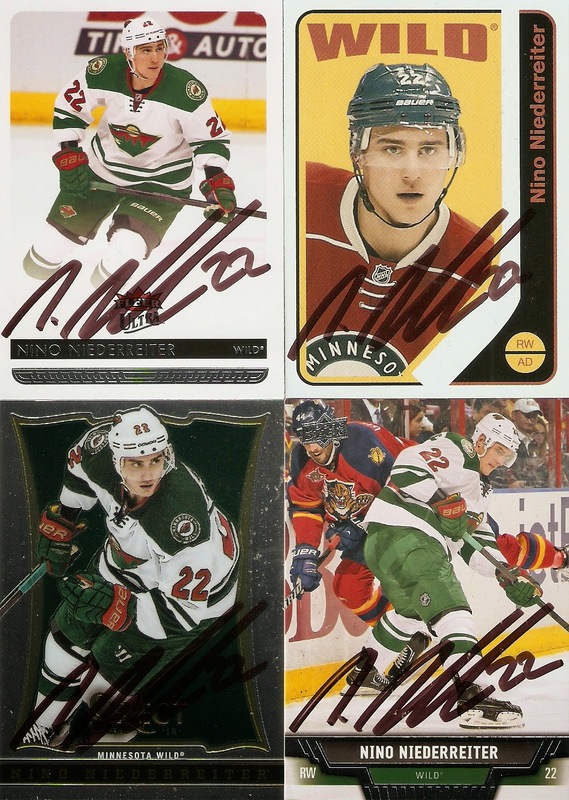 My very first success was Nino Niederreiter, who signed four cards and had them back to my mailbox in two weeks, which is a pretty quick turnaround for an active player, especially one as good as he is. They were sent out 1/13/15 and I had them in hand 1/27/15. I have a total of 15 out right now, with plenty more to follow. I know a few are long shots, but I was also sure to send out a few sure things. Now it's just a matter of playing the waiting game.